NOT A MEMBER? LEARN MORE & SIGN UP! What's in Your Future This Year? Find out by clicking on your signe below! 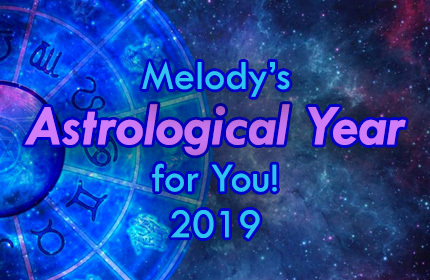 ESPchat's Psychic Advisor Melody, who also happens to be a gifted Astrologer, has prepared a look at the 2019 Astrological Year for all twelve signs. Just click on your sign below to get a glimpse of what you can look forward to this year! During the Mercury retrograde in Pisces from March 5th until March 28th, we may feel as though we’re not being told the truth or we may feel like an outsider. So, it’s probably best not to sign any contracts at this time because there could be something hidden that may come out and result in a legal battle. Generally speaking, 2019 is looking good for the Sun Signs, including earthy signs Taurus, Virgo and Capricorn. The planet Saturn will signal that it is time for a change and give you the willpower to succeed and push forward into something new, whether it’s a hobby, career change or a move to a better location. On the other hand, Air Signs, like Gemini, Libra and Aquarius, will resolve some old business and some of you who may have just gotten out of the fast lane in late March will finally start to settle down. Those who step out of your comfort zone will not only broaden your horizons, but could also find themselves back in the fast lane. Fire Signs (Aries, Leo and Sagittarius) will get fired up from late April into May but it won’t last past November. The planet Jupiter can lead to a legal situation, which may produce a financial gain in late 2019. For Water signs, such as Cancer, Scorpio and Pisces, 2019 could be an emotional year that may include a sudden loss of family and friends. The focus will be on PLANNING; planning and organizing can save you a lot of time and headache! Otherwise, you may be in danger of repeating yourself because something has been omitted or forgotten. Now that we have wrapped up the general reading, let's get started with the individual Sun Sign Predictions for 2019! This service is provided for entertainment purposes only. You must be 18 years of age or older to access ESPchat.com.